With the 2016 Rio Olympics beginning this Friday, we created a daily must-see list of events you shouldn't miss. If you are an Olympics fan, sleep now. Between Wednesday and Aug. 21, NBC and its networks and digital platforms will air 6,755 hours of programming from Rio, including 2,084 across NBC, Telemundo, Bravo, CNBC, Golf Channel, MSNBC, NBC Sports Network, NBC Universo and USA Network—the remainder is digital. (NBC produced 5,535 total hours from London.) If all that coverage aired on one channel, it would run for 281 days. Since it's not possible for one person to watch everything, we've provided a daily must-see list so you won't miss the big stuff. Preliminary soccer matches will be played the preceding two days, but the Games truly begin when the cauldron is lit (around 11 p.m. ET) at famed Maracanã Stadium. The favorite for the final torchbearer is soccer legend Pelé. The race (10:24 p.m.) shapes up as a U.S. versus Australia duel, with Simone Manuel, Lia Neal, Amanda Weir and Abbey Weitzeil the likely American quartet. U.S. coaches could also put Katie Ledecky in a heat; if the U.S wins the final, Ledecky would get a medal too, giving her a shot at five golds. World-record holder Ledecky goes for her first individual gold of the Games (10:01 p.m.). This is also the first night you are likely to see Michael Phelps—the men's 4 × 100 freestyle relay final is set for 10:54 p.m.
China has dominated men's Olympic gymnastics recently, winning gold in Beijing and in London, but Japan is the reigning world champ, behind all-around favorite Kohei Uchimura. 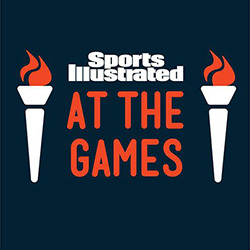 The U.S. men, coming off a fifth-place finish in 2012, have a chance at a medal. The competition starts at 3 p.m. The U.S. women have never won back-to-back Olympic team gold medals, but they're the favorites (at 3 p.m.) behind megatalent Simone Biles. Later that night, at 9:19 p.m., the women's 200 free final is expected to include Ledecky and Missy Franklin, who finished one-two at the U.S. trials. Japan's Uchimura could become the first man in 44 years to repeat as champion (at 3 p.m.). Four-time national champion Sam Mikulak is the best U.S. hope for a medal. The event starts at 3 p.m. By 5 p.m., three-time reigning world champion Biles will most likely be officially crowned an Olympic darling. Phelps's last individual Olympic swim comes at 9:12 p.m., assuming he makes the final. He has won this event at the last three Olympics. Ledecky's final individual race—the 800-meter free—follows at 9:20 p.m.
Fresh off her seventh Wimbledon singles title, Serena Williams looks to again pull off the All England victory--Olympic gold medal double, as she did in 2012. The match begins at 11 a.m. This is a chance for Jamaica's Usain Bolt to become the first person to win this event at three straight Olympics. The sprint is scheduled to go off at 9:25 p.m.
Kenya's David Rudisha put on a spectacular show in London, winning in a world-record 1:40.91. He has lost three times in 2016, so there may be an opening: Clayton Murphy and Boris Berian are the threats for the U.S. in a race set to start at 9:25 p.m.
Devon Allen, a sophomore wide receiver at Oregon, took first at the U.S. trials, with the third-fastest time this year (13.03). Jamaica's Omar McLeod owns the top two times. The gun will go off at 9:45 p.m. The Copacabana night will be rocking for the 11 p.m. start if, as expected, a Brazilian pair reaches the final. Kerri Walsh Jennings of the U.S. eyes her fourth straight gold, with new partner April Ross. Ashton Eaton of the U.S. is the defending champion and the favorite to join Bob Mathias (1948 and '52) and Daley Thompson ('80 and '84) as repeat gold medalists. The events begin at 8:30 a.m. This could be the last race of Bolt's Olympic career. It begins at 9:35 p.m. Twenty minutes earlier, the U.S. and Jamaica are likely to duel for gold in the women's 4x100. The viewing competition is stiff: the final round of women's golf (6:30 a.m.), the men's soccer gold medal match (4:30 p.m.) and the women's volleyball final (9:15 p.m.), in which Brazil has defeated the U.S. in the last two Olympics. But the team to watch is U.S. women's hoops, which is likely to be playing for its sixth straight gold at 2:30 p.m. There are multiple medals awarded before the closing ceremony, including the men's marathon (starts at 8:30 a.m.), men's volleyball (12:15 p.m.) and men's basketball (shapes up as the U.S.-Spain at 2:45 p.m.). The pick here begins at 1 p.m., when 20-year-old Claressa Shields of Flint, Mich., should be defending the title she won in 2012.